Summer is the season where clothing standards in professional environments start to slip. For a Muslimah, it can be a real challenge to find suitable clothing to wear in the heat. As I'm working for a while this summer, I need to have some smart outfits ready. Aside from a white shirtdress with tailored trousers, this is another great workwear look. 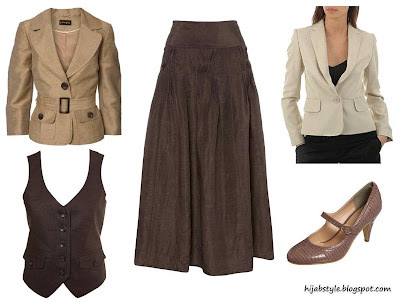 Chocolate pleat detail skirt £30, Principles; neutral safari linen jacket £62, Principles @ Debenhams; chocolate linen waistcoat £20, Wallis; blazer £35, Mango; court shoes £35, Miss Selfridge. If you can't find the skirt in Principles, Debenhams also stock it. ammena, nope I'm not in a hospital, I'm doing something totally unrelated, but still have to dress smart. Today I wore a brown checked skirt, a white shirt and my favourite hijab at the moment: http://thehijabshop.com/prod.php?code=VG01BROWN which would go quite well with this outfit too! Can you suggest additional summer outfits for those of us who only wear longer jackets with skirts and/or abayas? Jazaks! question: what do you do when your parents won't let you wear pants, even with long shirts? I'm 20 and my parents will NOT consider it at all. When will they let me be me and make my own decisions??? I'm 20 years old!!! And SICK of skirts. I am not a tomboy, but I am not super-girly, either. I just dislike skirts alot and after being forced to wear them for 5 years, I feel like I can't stand it anymore. Oh, and the whole "talk to them calmly and tell them how you feel" thing doesn't work. And please, please, don't tell me to get married. Anon 2, do you mean general outfits, or just ones for work? And when you say long jackets, how long do you mean? I personally don't wear anything longer than tops of thighs because I make sure I buy loose skirts so it doesn't require anything too long over it. Funny that, I'm trying to get into skirts more this summer! Not sure why anyone would tell you to get married though.. I suggest the following: Buy the loosest, most modest pair of wide-leg trousers you can find, then wear a long (and I mean mid-calf long) dress over it + all the rest of it, and see what they think. Show them that you can be just as modest in trousers, if not more modest, since you don't risk any leg showing when you're walking up stairs, etc. You could also mention that casually in a convo like this: "Oh I hate it when I'm running up the stairs and my legs come uncovered..and the leggings I wear underneath are tight.. I don't think they do the job properly *sigh* what can I do?" Catch my drift? Best of luck! thanks for the suggestion Hayah, but I already asked them about that and got a resounding no, lol. The marriage comment was because someone had suggested I get married to get out of my parents house. Brilliant idea, don't you think??!! Wow, they're tough! What is the reason they give though for not allowing you to wear them? I mean work outfits for the summer weather. I prefer to wear jackets long enough to just above the knee, sometimes a little higher. I find that it gives me the best coverage. but it definitely needs brightening up with a patterned hijab! Avoid skirts which flare out too much though - a straight cut is best to minimise bulkiness. @ hayah: oh, they say things lik women should not imitate men, pants are men's clothes. I prefer to dress in more modern clothing and dislike things that look like just a twist on the punjabi/salwar kameez. Even tho LOADS of girls wear pants at my school with above the knee coats/ long shirts. My parents just think that all those girls are wrong. Salaam sisters, I have to wear smart clothes at work, because of the type and postion of my job. But I have a trick up my sleeve. I wear what I like, trousers skirts, blouses, but I always wear a very long free flowing black, sleevless waist coat style top, pastmy kness, over what I wear. That way, I still look smart, I can wear what I like, and it hides my lumps and bumps.